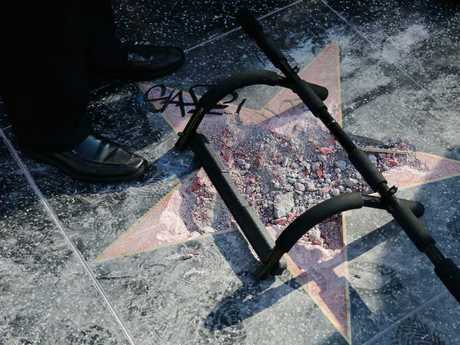 DONALD Trump's star has dimmed in Hollywood, after a suspect with a pickaxe vandalised his star on Hollywood's Walk of Fame early on Wednesday morning. 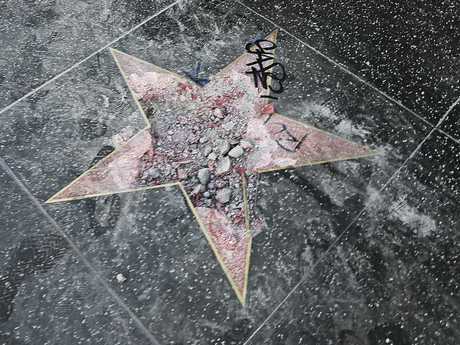 It's the second time vandals have damaged Mr Trump's star at the Los Angeles tourist site. 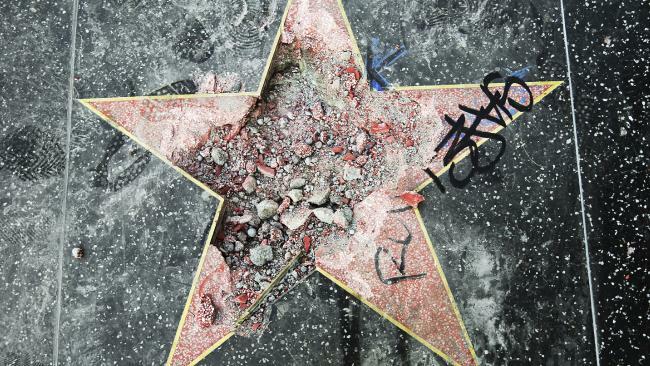 Witnesses told ABC7 a man removed the pickaxe from a guitar case and began swinging it at the brass-rimmed star - one of more than 2500 embedded in Hollywood's footpath in honour of famous entertainment figures. Before he was elected president in the November 2016 election, Mr Trump starred in The Apprentice TV reality series. 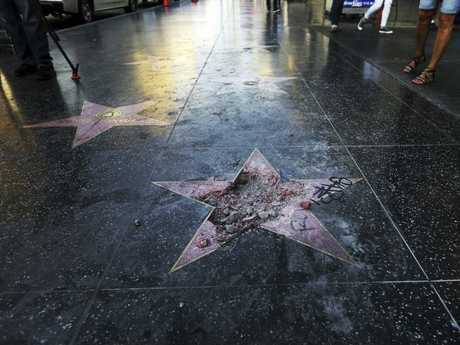 Los Angeles police confirmed that they were called about 3.30am after a report of vandalism at the star's location on Hollywood Boulevard. The entire centre of the star was hacked out, leaving only pebbles and dirt where Mr Trump's name had been written large above a small image of a television. 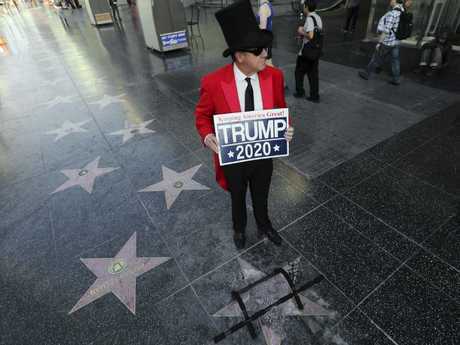 The star was targeted once before, in October 2016, when a man dressed as a construction worker defaced it with a sledgehammer and pickaxe, in what was reportedly a protest at Mr Trump's treatment of women. In February 2017, the month after the US President's inauguration, the man named James Otis pleaded no contest to felony vandalism. He was sentenced to three years' probation and agreed to pay $US4400 for the damage. Tensions have risen in US society over Mr Trump's unorthodox and divisive presidency, though the motive in Wednesday's attack was not immediately clear. "The Hollywood Walk of Fame is an institution celebrating the positive contributions of the inductees," said Leron Gubler, president and CEO of the Hollywood Chamber of Commerce, which administers the Walk of Fame. "When people are unhappy with one of our honorees, we would hope that they would project their anger in more positive ways," he said. "Our democracy is based on respect for the law. People can make a difference by voting and not destroying public property."